Visited 360 on a Saturday and was pleasantly surprised how good this was. It had everything for the children and adults to enjoy as a family. There was go carting and a fabulous messy corner. The children loved the soft play climbing frame and is a well thought out enjoyable place to let the kids be kids whilst parents can either join in or sit back and watch whilst having a coffee. I am definitely going to visit again. We love creating fun experiences for the children who visit us and our parties are a great way to celebrate birthdays, the end of term or a long overdue family get together. Over the next 4 weeks we will be giving you the chance to win one of our parties! From a party for toddlers, right through to exclusive use of the entire centre for up to 100 people! 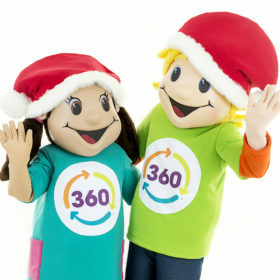 Visit our Facebook page 360 Play Stevenage to be in with a chance of winning. Each week this month we have a fantastic 10% off one of our parties when you book in the centre. Week 1. April 1st – 7th 10% off our Classic party package this week when you book in store! Week 2. April 8th – 14th 10% off our Toddler parties when you book in store! Week 3. April 15th – 21st 10% off our After School parties when booked in store! Week 4. April 22nd – 28th 10% off a Private Hire when you book in store! When travelling to us by car we are easily situated on the Stevenage Leisure Park just a few minutes from the city centre. If you follow the brown tourist signs they will bring you straight to us. The leisure park is located between Six Hills Way, Fairlands Way and Gunnels Wood Roads close to the train and bus stations, a short walk from both. If you are coming from further afield we are 5 minutes from Junctions 7 or 8 of the A1(M). The Buses are SB2, SB3, SB7, SB8, 55, 100, 101, 102 & 301. These stop at the Train Station, Leisure Centre and Bus Station in town – these are all a short 5 minute walk over the station’s pedestrian bridge and across the Leisure Park car park (you can see us from the bridge). The nearest Railway Station is Stevenage which is just a few minutes walk from 360 Play (you can see us from the bridge). We went for the first time this week and was taking back on how good the place was and I will be telling everyone about it. The place is massive and has loads for the children to do all of which is inconclusive within the price of entry. I was taking back with how clean it was and watched staff consistently cleaning during our time there. We had food from the cafe as again was surprised with the quality of the food we received. My daughter did not want to leave and we will be going back again soon. My son loves it there! My son loves it there! It took us just one visit to realise that we wanted to become annual members!!!!! We are there once a week if not more!